The olive branch has long been a symbol of peace and goodwill. We've all heard the expression, "extending the olive branch," used when extending an offer of peace or reconciliation. In Asti, we have many olive branches, many olive trees that give me a sense of peace when I look at them. I never tire of their simple beauty. They provide us with their wonderful fruit and if that's not enough, we then get to enjoy the most delicious oil too! I think the olive branch, a symbol of peace, also represents fall in all its glory, don't you? 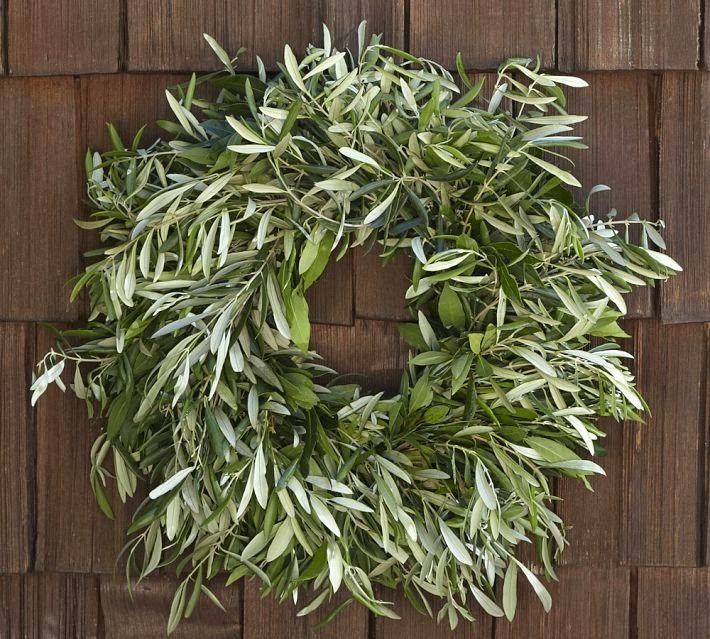 This year, I'm planning to make an olive branch wreath for late fall and into the holiday season like this one from Pottery Barn. Love, love, love olive branches. Thanks for posting that wreath I think I will try one as well! I'll bet your olive branch wreath will be gorgeous. The branches you cut look sooo good in the confit pot. Delores, you are so fortunate to have such lush gardens both in SF and at Asti. The olive branch wreath will be gorgeous. Thanks for sharing this beauty. This is beautiful! Love those olive branches. What a nice way to celebrate the olive tree! They really are lovely trees. My new neighbor has them in his side years, and I will have two in my front yard, with white iceberg roses beneath them. Your olive branch wreath will be beautiful! I love olive trees. They remind me of Italy and France. I wish I could grow them here. Looking forward to seeing your wreath when you make it. Those olive branches are gorgeous! I've never seen one in "real life". They look similar to stalks of rosemary!